Epoxy contractors report that demand is booming from both homeowners and new-home builders. Over the last 30 years, there has been an increasing demand for residential applications, says Harvey Chichester, CEO of Concrete Floor Coatings of Minneapolis, Minn., an epoxy-coating manufacturer. The best coatings are two-component epoxies with 100% solids. Never use a water-borne epoxy for a garage floor, says Parker. A water-borne epoxy is just not tough enough under hot tires. Coatings experts advise that its appropriate to be wary of inexpensive coatings, since a few manufacturers have been known to tout ordinary deck paint as an industrial coating. There is no such thing as a one-component epoxy, warns Muzzillo. Once a slab has been thoroughly prepped for coating, the hard part of the job is over. An epoxy coating is usually applied with a roller. A smoothly troweled concrete slab needs to be roughed up by either acid washing or shot blasting. Acid washing (or etching) involves mopping a dilute solution of muriatic acid over the floor, then rinsing thoroughly. Because the procedure is fairly simple, its popular with many contractors. But most coatings specialists advise that abrasion with a shot blaster prepares a slab more thoroughly than acid washing. A shot blaster is a self-contained portable piece of equipment that shoots metal BBs onto the floor, roughening it and removing about 1/16 inch of concrete. The shot is collected in a rebound chamber and recirculated, while the concrete dust is sucked up by a vacuum connection. Shot blasters are manufactured by BlastCat (800/524-0544, www.blastcat.com), B.W. Manufacturing (616/447-9076, www.bwmanufacturing.com), and SASE Co. (800/522-2606, www.sasecompany.com). Most garage floors require a full day for prep and patching. The epoxy coating is then applied with brushes or rollers. A durable floor will require at least two coats of epoxy, which must cure overnight between coats. There is no such thing as a good one-coat job, says Parker. Once the final coat is down, its best to wait at least three days before allowing a vehicle into the garage; full curing can take up to two weeks. Coating contractors know that the main reason for the growing popularity of epoxy flooring is the look  the wow factor. Several contractors describe homeowners who have visited a neighbors epoxy-floored garage and declared, Ive got to have one. Thats why epoxy contractors offer a wide palette of colors, as well as decorative patterns created by adding contrasting vinyl chips or colored quartz aggregate to the top epoxy layer. Coating companies describe these options variously as speckled, terrazzo, marble-like, or granite-like. Some types of color chips do double duty by providing an anti-skid texture to the floor. 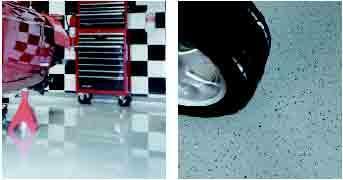 Epoxy garage floor coatings are popular with car hobbyists (left). Because epoxy cures to a glossy finish, the surface is easy to keep clean. Some types of coatings, like this one from Rust-oleum (right), include color chips for a granite-like look. But in colder climates, where cars leave puddles from melted snow, most epoxy contractors add skid-resistance aggregate to their floors. At some point you have to find a happy medium between a very smooth surface that is easy to keep clean and an anti-skid surface, which is easier to walk on, says Parker. Anti-skid additives include sand, pumice, ground walnut shells, and colored quartz granules from 3M. These additives can either be mixed with the liquid epoxy before application or broadcast on the top coat while it is still wet. Moisture problems. For any coating to bond well, the concrete must be dry. Moisture in the slab is the biggest problem with any kind of epoxy flooring, says Brian Fortman, sales manager at HomePro Floor Coating Systems, an epoxy contractor in Farmington Hill, Mich. As long as there is a layer of polyethylene under the slab, there is generally no problem. In one out of a hundred jobs, we have blisters in the epoxy coating because of excessive hydrostatic pressure, says Ghashghaie. If there are any hints of a moisture problem, most epoxy installers wont proceed before performing a moisture test. This generally involves taping a small square of polyethylene to the slab and checking under the poly for condensation 24 hours later. How much? The cost of an epoxy floor depends on the prep methods and the number of coats, and ranges from $1.50 to $5.50 per square foot  about $1,000 to $3,500 for a two-car garage.